How Do We Make More Money? Let’s Call It "Organic"!!! I’ve already spent enough time about this product. I analyzed how well it makes pancakes and waffles last month. But I couldn’t believe when I saw this at our local Hy-Vee Grocery Store. For you local readers, I was at the Shadow Lake Hy-Vee. But look at that price!!!! For a can of batter? Really? In most other ways, I really enjoy shopping at Hy-Vee. I’m reminded of the really nice Publix grocery stores in Viera and Suntree, FL. The store is spacious and there’s a wide variety of products. Today I wandered into the Organic Foods section, in search of whole wheat pastry flour to make some Boot Track cookies. 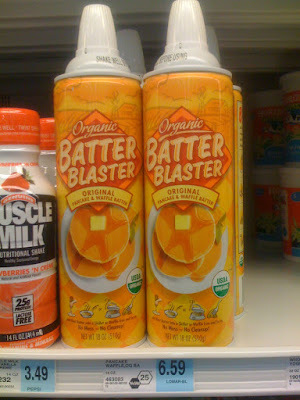 I then looked at the dairy section and saw the Batter Blaster there. For $6.59 a can. As mentioned in the first Batter Blaster blog post, I saw it at Super Target for $4.59, and I got my 3 cans for $2.97 at Costco. That’s quite a price difference! Why would the price be so high here? I wonder how much Hy-Vee paid for it? I think someone is milking that “organic” label on the front. Which leads me to a whole other discussion: Why does it cost so much to feed your family high quality foods??? Fresh fruit costs more than canned. Fresh cuts of beef costs more than frozen burgers. Fresh bread at the bakery costs more than a loaf of Wonder Bread. Organic ketchup costs more than Heinz.